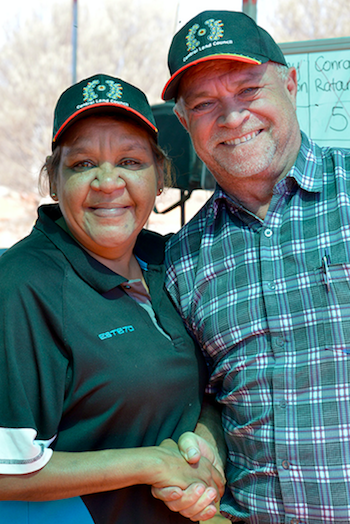 Mr Wilson, the chair of the board of joint management of the Uluru Kata Tjuta National Park and owner/operator of cultural tourism company Uluru Family Tours, pipped Ms Shaw by four votes, according to a CLC media release. “It feels very special to be elected on my grandfather’s Paddy Uluru’s country,” Mr Wilson is quoted. Mr Wilson, from Mutitjulu community, vowed to pursue the Uluru Statement from the Heart with whomsoever wins the coming federal election. “My election results shows that the Central Land Council is ready for change,” she is quoted in the release. Mr Wilson thanked the outgoing CLC chair, Francis Kelly, for his six years of service and presented him with a kulata (spear) and spear thrower (mirru). The CLC election was carried out by the Northen Territory Electoral Commission. Evelyn: When wati [men – ED] are on the road no one should be on it. They have women’s meetings all the time. The board of CLC was set up so the leaders of a community area which is WATI could hold his respect and protect his country and people after the whites had taken it. The fight begun with the men (TJILPI) to gain some of their land back. Where is Barb a delegate for? They gonna be kicking the poor bugga out of the meeting when they talk about sacred sites and cultural issues. They need to put a line through this and put a wati [man] back in.